A Norwood officer empties out the drug kiosk in the police station. Norfolk District Attorney Michael W. Morrissey likes to say that a simple idea has gone a long way in the battle against widespread opiate addiction in area cities and towns. “Get the stuff out of your medicine cabinets,” said Morrissey in a recent interview about the National Prescription Drug Take-Back Day, happening this year on Saturday. He said the annual event inspired a long-term initiative that has proven to be a “slam-dunk” in more than 25 communities in the Boston area. Beginning in March 2011, local and state agencies have worked together to place drug kiosks — clearly marked, secure containers — inside the lobbies of police stations. “We took a simple idea and ran with it. We don’t have to wait for take-back. Why not have take-back every day?” said Morrissey. In the suburbs south of Boston, addiction to opiate narcotics, such as OxyContin and Percocet, is an epidemic striking young people, with police warning that prescription pain pills are leading habitual users to heroin, since prescription pills on the street can cost an addict $250 per day while a bag of heroin is $10. The first “MedReturn Kiosks” appeared a few years ago in secure police foyers in Braintree, Milton, Quincy, and Weymouth. The containers, which cost an estimated $900 each, were paid for by Impact Quincy, which was funded in 2009 with a grant from the state Department of Public Health’s bureau of substance abuse specifically geared toward addressing opiate overdoses. Other communities soon got on board, said Morrissey, pointing out that research shows young people often fall into drug addiction by taking pills from the home medicine cabinet. Prescription drugs such as OxyContin, Percocet, and Vicodin, among others, are linked to addiction. Local law enforcement officials say “multiple tons” of prescription drugs have been collected from kiosks placed in police stations in Bellingham, Braintree, Brookline, Canton, Cohasset, Dedham, Dover, Foxborough, Franklin, Holbrook, Marshfield, Medfield, Medway, Milton, Needham, Norfolk, Norwood, Quincy, Randolph, Sharon, Stoughton, Walpole, Wellesley, Westwood, Weymouth, and Wrentham. Additional kiosks were paid for with funds from a variety of sources, including Impact Quincy, the Norfolk prosecutor’s office, and individual communities. Inspired by the example set by Norfolk County, the town of Marshfield was the first in Plymouth County to install a MedReturn kiosk at the local police station in October 2012. By January 2013, Hingham and Pembroke had installed 24-hour drop-off boxes — and, most recently, in April, a kiosk arrived at the police station in Norwell. In Bristol County, kiosks now exist at police stations in Easton and Swansea. “It is really working great. 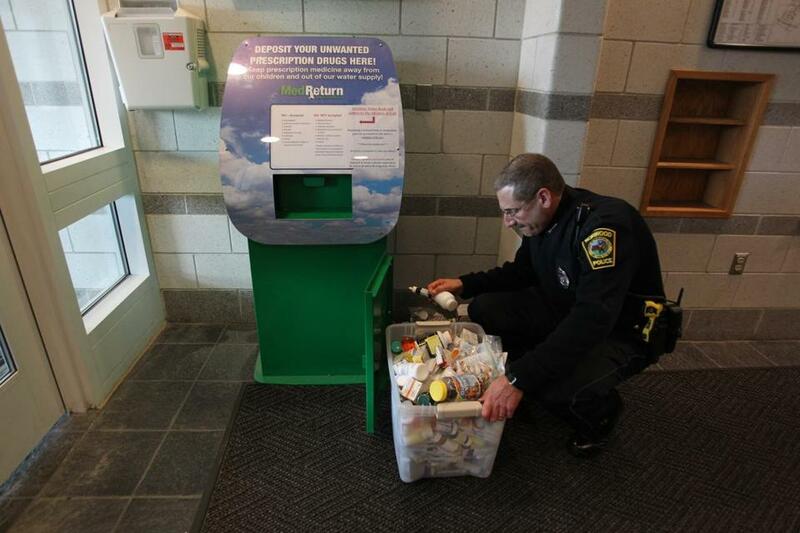 In many cases, police stations are dumping their containers about once a week,” said Morrissey, who recently returned from a national conference in Florida on the prescription drug take-back efforts, which he attended with representatives from Braintree, Needham, and Weymouth. The April 27 event, coordinated by the US Drug Enforcement Administration and local agencies, has resulted in the collection of more than 2 million pounds — 1,018 tons — of prescription medications from circulation nationwide over the past five years. Weymouth Drug-Free Community coordinator Lyn Frano said the town hosts a take-back day about four times a year and the police are emptying the kiosk at the local police station all the time. “People are understanding the importance of getting rid of unwanted prescription medicine, especially narcotics, because they are so abused all over the country,” she said. In Braintree, Mayor Joseph C. Sullivan said the town has a kiosk in the foyer of the police station and participates in the annual take-back day. He said the kiosk is filled and emptied on a regular basis. Morrissey said it is worth making the trip to the local kiosk to dispose of unnecessary drugs. Meg Murphy can be reached at msmegmurphy@gmail.com.